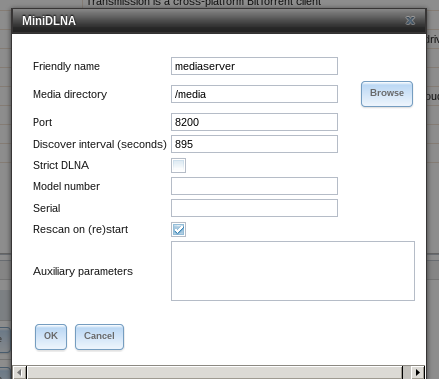 I created a post on my personal blog that describes how to set up Freenas 9.2.0 with Transmission and Couchpotato as a DLNA-Server and I figured, I might post a link here to it. Feel free to give some criticism and what to improve. 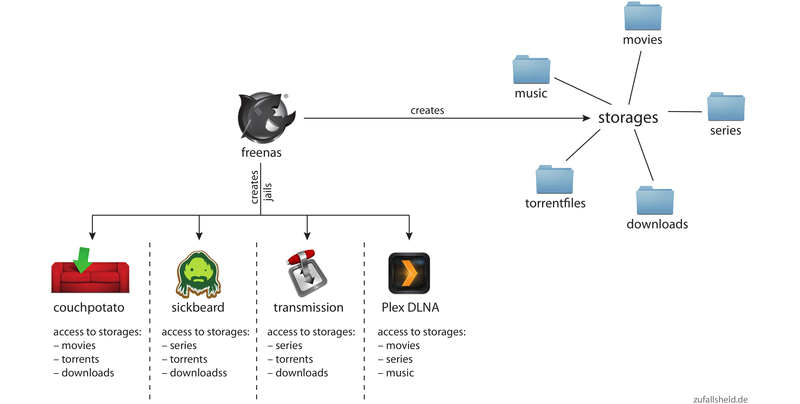 I'm going to describe how to set up Freenas with the popular plugins couchpotato, sickBeard or sickRage and transmission to use them for downloading movies or series and streaming them via DLNA as well as mounting the storage on Linux. If you want to support me, you can now flattr the post (under the headline on the right site). This way you give micro donations to me. To read more about flattr, visit its homepage! I'd really appreciate it! With this setup, I manage my movie collection and my wanted movies with couchpotato, which uses transmission to download them. I also use SickBeard to download TV series. Then I can stream them with the DLNA-server to my TV. I'm running Freenas on a HP ProLiant G7 MicroServer N54L. Freenas itself is running on a micro-USB stick. I'm not going to describe how to download and install Freenas on the stick, as described in detail in the docs. After starting the server and waiting some minutes, Freenas is available under a web-front end. The URL is a local IP-address, which is shown when Freenas has finished starting. After opening it, you're presented with the installation wizard. Choose your preferred language, timezone and key mapping, then press next. In the next step you can create a pool, but press exit, because we're going to create one later. Next on we have to edit the network settings. Go to network > Global configuration. 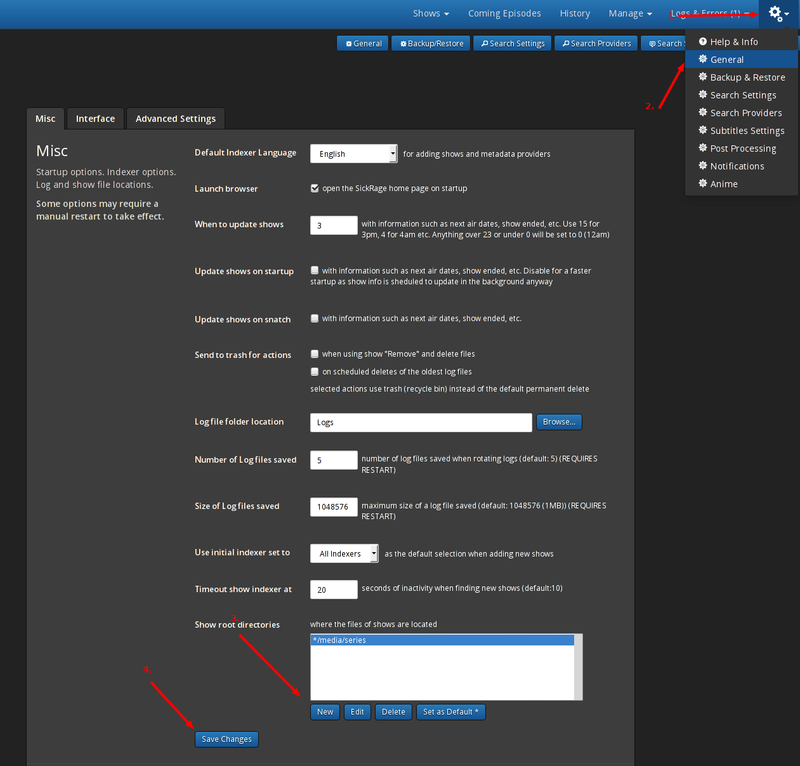 There you can change the name of your Freenas, set the default gateway, name server and so on. Since I use my server at home, I set the gateway and name server to the address of my router. If you want to, you can enable the netwait feature. If enabled, your server will ping the addresses in the IP list when it starts to check if a network connection is possible. There are some more settings that you should know about and edit. Open the System > Settings tab. If your network is secure and only authorized people join it, you may let the Protocol option set to HTTP. Generally it is recommended to set it to HTTPS. The next option defines the address and port your Freenas-installation listens to; set it to the IP-address the Freenas currently listens on. 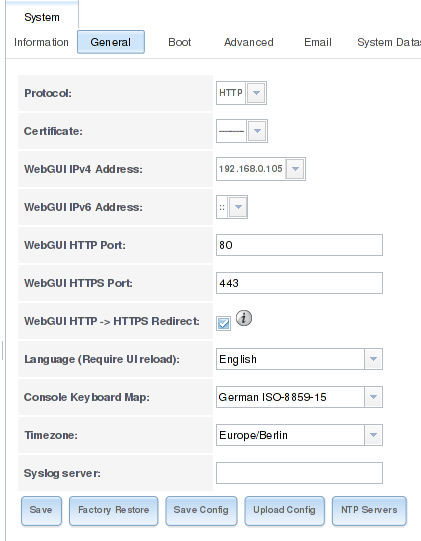 Set the HTTP-port to 80 and the HTTPS port to 443. 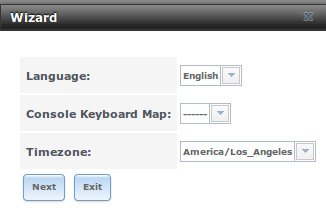 Next on there are specific settings for your language, keyboard map and timezone. Set it according to your preferences. If you're not using a syslog server or directory service, leave the last two options empty. The next steps will include creating storages and jails. To get a better understanding on how these components will work together, my beautiful girlfriend created two diagrams that show how the magic happens. The first image shows the storages and jails that I created and what jails can access which storages. The second image shows the steps that happen, when you want to download a movie or series via Couchpotato/SickBeard. Now is the time to add some storage to your server. That is the most important part and you should carefully read the documentation the Freenas community offers. I will not go into detail on what volumes or RAIDs to use. It mainly depends on your needs and what you've got hardware-wise. My use-case is a simple movie- and music-streaming server with no personal or private information saved on it. To simply create a new empty volume and attach disks to it, open Storage > Volumes > Volume Manager, give your new volume a name, add your disks and configure the layout. To logically separate your files, e.g. movies from music, you can create datasets. These datasets can have separate permissions, quotas, etc. allowing you more control over your data. I created datasets for every kind of data I want to manage: movies, series, music, downloads and torrent-files. To create a dataset click on your created storage, then hit the Create dataset-button (the one that looks like an excel-document with a plus). There, set the name for the dataset. You can ignore all other options for now, as they are for advanced users. Since there are many plugins and users who want access to your storage, you'll have to configure the permissions for it. The best way is to set the ownership of the storage to nobody and give read/write/execute permissions to everybody. You should only do this, if you trust the users of your network. To change permissions, click on the Storage tab, select the volume you want to edit and click the first button in the bottom line that displays hard disks and a key. There, set the Owner (user) to nobody, the Owner (group) to nogroup and activate all buttons in the mode. Type of ACL should be set to Unix. Tick the box that says Set permission recursively so all other folders and files in the volume will have the same permissions. Since I want to access my music and movie collection not only with my TV but also with the computers I'm using, I have to add sharing possibilities. Freenas offers NFS, CIFS and AFP out-of-the-box. I don't have an Apple-gadget or Windows machine at home, so I'll only need NFS. To add a NFS-share click on Sharing > Unix (NFS) Shares > Add Unix (NFS) Share. There, set the options Mapall User and Mapall Group to nobody and nogroup respectively. In the path, add all the storages-directories you want to share. You'll have to create a separate share for every dataset. When you're done, you can mount the directories via NFS, the address is the IP-address of your freenas-installation plus the folder you shared, e.g. Installing plugins is very easy, as long as you stick to the available ones provided by Freenas. In the Plugins-menu, click on the plugins and then on Install, to install them. Each plugin is installed into a jail, a separate "operating system" in Freenas itself, but we'll get to that in the next section. If you're on Windows and want to connect to your Freenas-installation using Putty, you have to enter the IP-address of Freenas into the Host Name-field, then press open. If Putty cannot connect, you probably didn't use the correct IP-address or you forgot to enable SSH. To enter one of the installed jails, type jls on the command-line. There you'll see the available jails. To connect to them, enter jexec # tcsh where # is the number of the jail. Now we'll have to add the storage to the plugins, so Couchpotato, transmission and the DLNA-server can access the same storage and work together. Since jails are separate systems in the server-OS itself, they cannot by default access other parts of your system. To add the storage, go to Jails, click the plus next to the plugin, open the Storage tab and click Add storage. You'll then have to enter the source and destination addresses. The source is the storage or dataset you created in the first place. If you did not create datasets before, you either have to do this now or create normal directories as sources with mkdir on the server. The destinations are directories in the jails that get mapped to the storages outside the jails. If the destination addresses in the jails do not exist, tick the Create directory-box. The following part is really tricky as Transmission, Couchpotato and Sick Beard behave very differently with the directories they download data to. I had to edited the following configuration multiple times, so be sure to stay up to date. Transmission (bit_1): You need the torrent-directory, where Transmission looks for torrents and the download-directory where it downloads the data to. 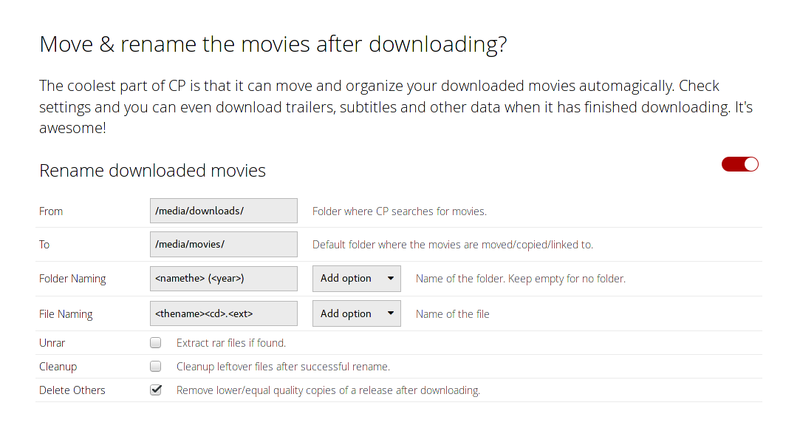 couchpotato: You need the downloads-directory where transmission puts its data into; you'll also need the movies-directory, where couchpotato moves the downloaded and renamed movies to. Sickbeard/SickRage: You need the series-directory where SickBeard puts its data into; you'll also need the torrents-directory, where SickBeard puts the torrent file for Transmission to download them. MiniDLNA/Plex: You'll need every directory where files are located that you want to play using DLNA, e.g. movies and series. Now that you have added the storage to the plugins, you can finally start them. Go to the Plugins-page and click the red OFF-button of all plugins. After that, they should be listed as on, except for miniDLNA, which we'll have to configure first, but not now. Thats 50 characters and if you add the jail-directory to it, it exceeds Freenas' directory-length limit of 88 characters, so you have to change this. 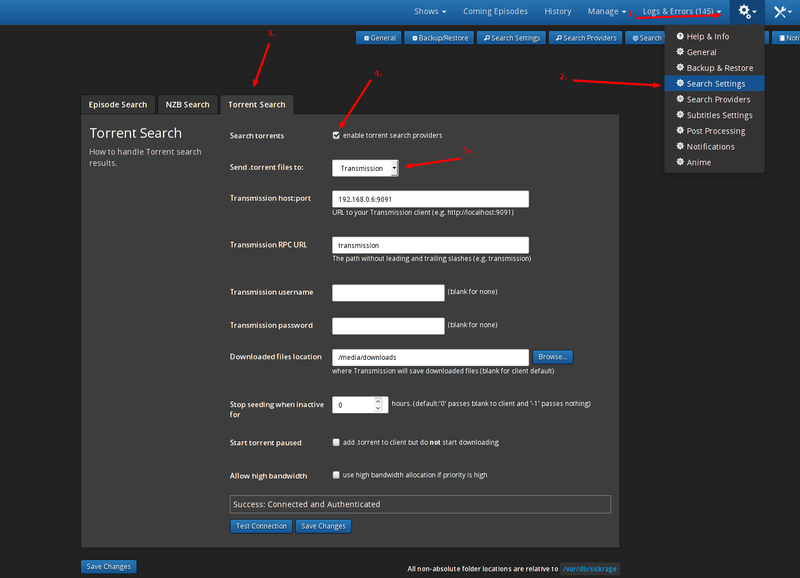 Open up the Transmission-settings in the Plugins-tab of Freenas and edit the Watch Directory to /media/torrentfiles and the Download-Directory to /media/downloads. Incomplete downloads are put in a separate directory so other plugins do not interfere with the downloads. The Download-Permissions have to be 777 so every plugin has access to the downloads and can move them from there. Next open the transmission-address in your browser. You'll see the main interface of Transmission. Click the screwdriver icon in the down left corner to edit the settings. There you'll see the download to option. There should be /media/downloads now, too. 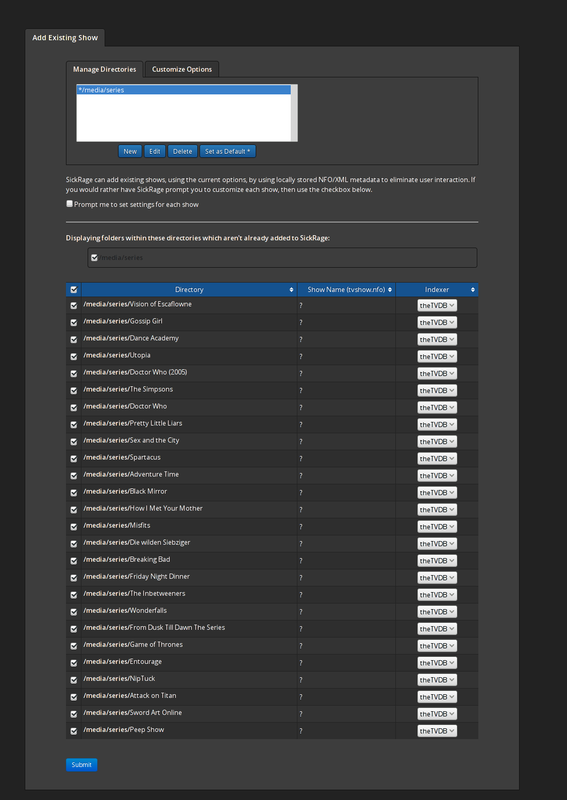 HolyK in the Freenas-forums mentioned a great front end for the remote transmission server, transgui. You can find it here or in your favorite package manager. It's a nice replacement for the rather featureless web front end of transmission. It's available for Linux and even Windows. After you installed it, point it to the IP address of your transmission-server and then you can see the movies downloading and even add torrent- or magnet-links so they will be downloaded to you Freenas. Open the couchpotato-address in your browser. You'll be greeted with the install wizard. Scroll down to advance in the wizard. Define a user name and password in the General section if you'd like and leave the port to 5050. In the downloaders-section choose Transmission. As host enter the address of your Transmission jail (you can find the address in the jail-section of Freenas). Leave Directory empty so Couchpotato uses the transmission-default, which is /media/downloads. Scroll further down to Move & rename the movies after downloading? (skip the Are you registered at any of these sites?-part). In the from-folder set the same folder you just used for the Transmission-directory. The to-directory is where the renamed movies will be stored. Set it to the movie-source configured in the chapter Adding storage to the jails. Tick the Cleanup-box so leftover files will be removed after renaming the movies. After that, scroll further down and click the huge green button and you're done with the wizard. 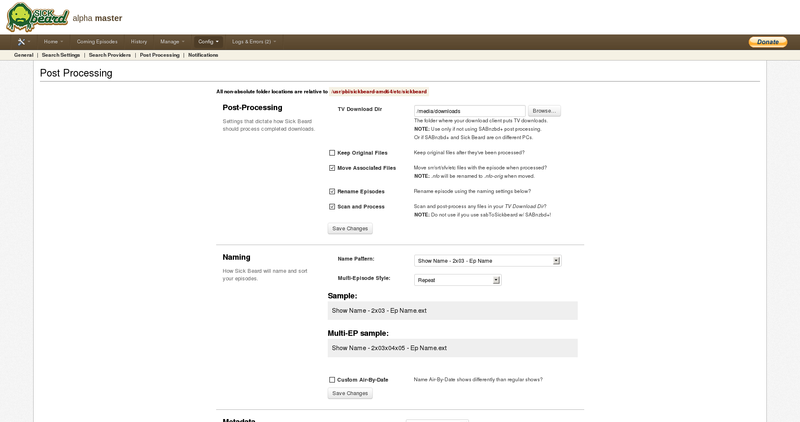 On the main page of couchpotato, click the screw-icon in the upper right to get to the configuration-page. There are many things to tweak here, but I'm not going into detail about them. Right now you have to open the General Tab, click on Show advanced settings and then enter 0777 in the fields Folder CHMOD and File CHMOD as shown below. If you do not do this, you probably will be getting an error-message later in Transmission, when downloading files (the download stops at around 4MB)! Many people favor SickRage instead of SickBeard. When I initially wrote this guide, SickRage didn't exist so I added it now to the guide. You can choose between installing SickRage and SickBeard (or even both!). If you want a comparison between them, take a look here. For long-term updates choose SickRage! Install SickRage as usual and add the storages to the jail. Then open the web interface. The first thing you've got to do is to update it. After updating SickRage it will restart (if it doesn't, restart by yourself from the freenas-frontend). Back in the frontend again click the screws in the top right, in the drop-down menu on General. Here you'll find the main settings. The important setting to change is Show root directories. Click new and choose your series-directory (/media/series). Last save the changes. Now its time to a add downloader to SickRage. Click on the screw-icon > Search settings, then click on the Torrent Search-tab. There tick the box that says enable torrent search providers. In the drop-down-field under that choose Transmission. Then insert the IP-address of your Transmission-jail (including port [by default: 9091]). In the Downloaded files location-field enter the Downloads-storage (/media/downloads/). Test the connection and save the changes. Now searching and downloading shows should work with SickRage! If all your shows are in a separate subdirectory, then it should look like this. 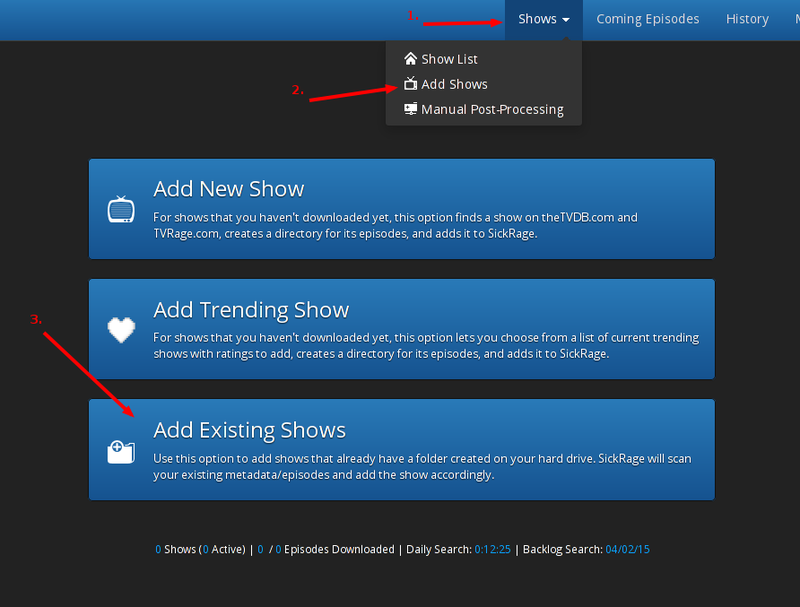 By pressing Submit and afterwards filling out some information on each of your shows, SickRage will process these. Install SickBeard as usual and open the web interface. Since I currently only load movies with (free) torrents, there are some settings to make. Then go to the Search Providers tab. 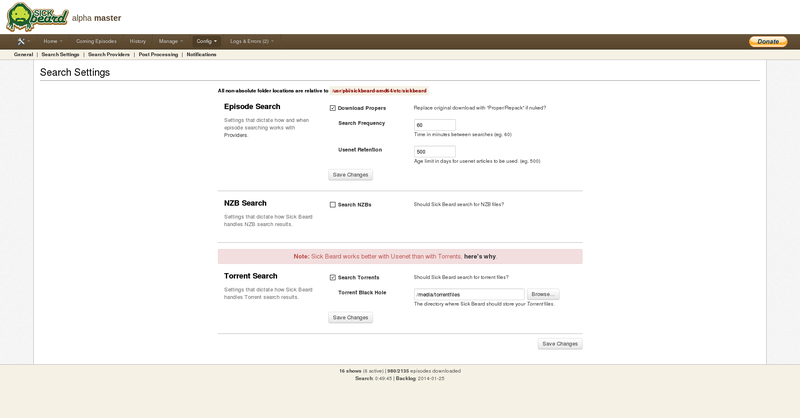 There, check the box for EZRSS as it is the only free torrent search for series. If you are a member of any other torrent sites listed there, check the boxes for them and enter your credentials for this site. Again save the changes. If you're done, you can add new or existing shows and let them download! Now you have the choice to either use MiniDLNA or the Plex MediaServer. If you want a nice interface to manage you music and movies, use Plex. 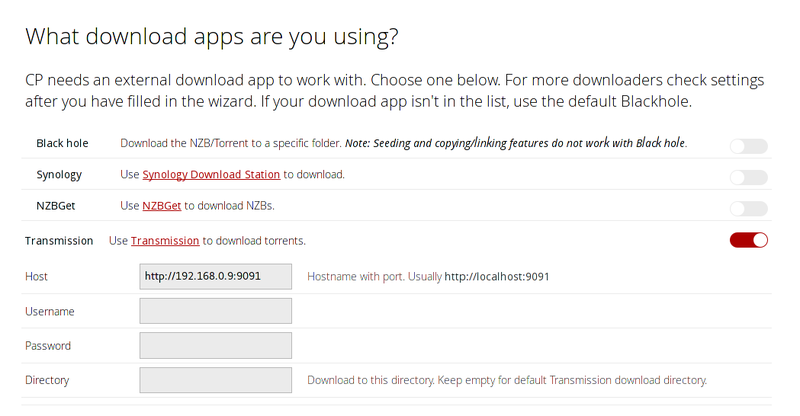 If you only need a DLNA-server, use MiniDLNA as it is easy to configure. I'll describe the installation and configuration for both. 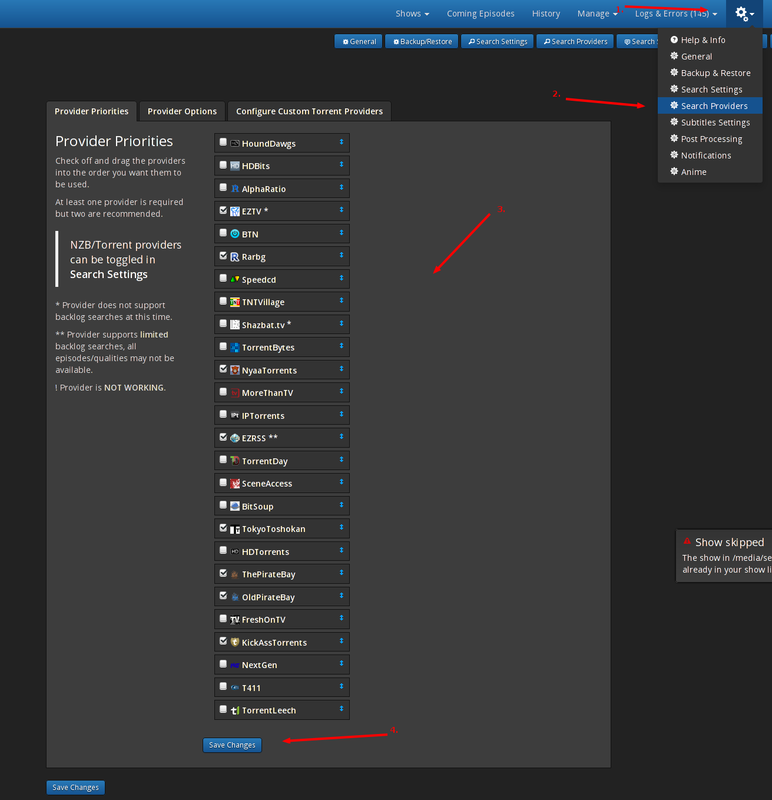 Open the Freenas-front end, go to plugins and open the MiniDLNA-configuration. There, set the name of the MiniDLNA-server to anything you like and the Media-directory to the destination set in chapter Adding storage to the jails. Leave the other options as they are. The DLNA-server will only scan for new files in its directory on restart, so if you are adding a movie and do not restart the DLNA-server, it won't be available for streaming. To work around this issue, use the fix described here. After rebooting the DLNA-server should now scan for new files every 5 minutes. Do this for your music and series, too. If you have everything added, jump to the next section. There you can add some channels to use with Plex. I skipped them. Click Next and Done and your are it..done! Now you should see the dashboard of Plex filling with your movies and music. DLNA is enabled by default, so you don't have to do anything in this regard. Now you are able to download movies with couchpotato and transmission and once they're downloaded, they are automatically available on you DLNA-server for further streaming. Hi, good article, thank you for that. 1] Stop Transmission before touching the config.json file or it will get overwritten. 2] umask "0" is not security-friendly. Beter is to go for umask=2 and then add admin's user as an member of transmission group. So only the admin will be able to actually delete the files from download folder via CIFS. BTW: Welcome to the forum ! zufallsheld: Can you please put your guide in your post? Including links to other servers is not preferred here because too many people link to stuff that later disappears leaving the thread a zombie. 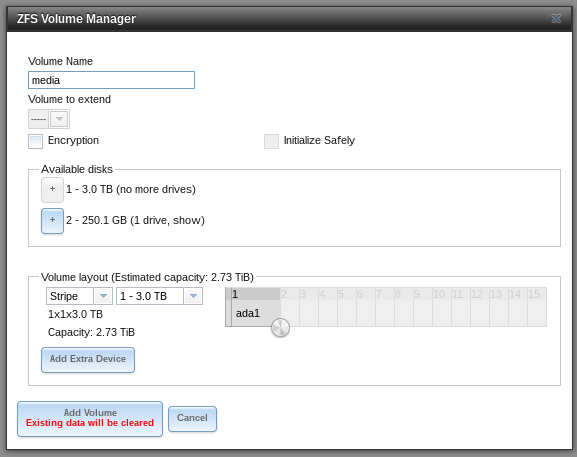 The whole setup with read/write-permissions for everybody on every storage is not user-friendly. But my first attempt was to get everything done so it works, partly because there's no need for me to have it more secure in my own home network. But yes, it should be more security-friendly and I will update this guide, when i edited the permissions. Thanks, enjoying it so far! Thanks for the heads up on the Trans GUI. Love it! Sorry for this stupid question. How can I edit settings.json? Is there a detailed procedure to do it? Use the vi command. Google vi editor in god and will find the commands. Or use nano (http://www.freebsd.org/cgi/man.cgi?manpath=freebsd-release-ports&query=nano). It easier to understand/learn than vi. nano is not installed by default (atleast in my jails). I also edited the guide to answer the question. Oh yes, you are right (but "pkg install nano" will fix that ). However, you do not need to jexec into the jail to edit files. You can also run "nano <jail_root>/<jail_name>/usr/pbi/transmission-amd64/etc/transmission/home/settings.json" directly in FreeNAS shell to edit the file. I followed your directions and transmission plugin won't start (when I press on the button "off" below service status, nothing changes). any idea? Edit the path to your needs and be sure to delete the right directory! Thanks for the reply. I tried to delete the folder jail but the operation is not permitted… I tried using the user root and my user (who is the owner) called donat. 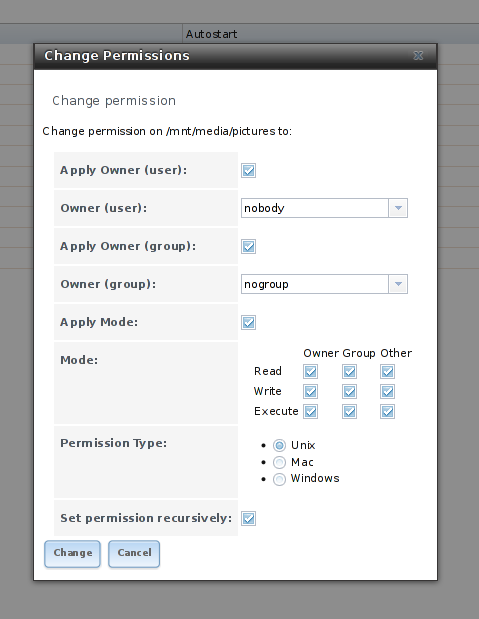 I made sure that the volume's permissions are set to read/write/execute for the owner (donat) and group. EDIT: sorry, I was trying to delete the folder jail… deleting the folder transmission worked fine. Yes, I just noticed this and corrected it in the guide. The problem here is, that sickbeards "TV download dir" is a directory local to sickbeard, BUT is given to transmission, which is not local. I edited the guide again and standardized all the storage-paths. Please take a look and edit them. They're much cleaner and less confusing now! You have to delete the folder "transmission" in the jails-folder an reinstall the plugin. Thanks, i added it again!